The Code 4 Foundation exists to help bridge the financial gap when tragedy or illness befalls a fellow member of law enforcement. Even with insurance, agency support, union contributions, it can take a while before much needed financial relief arrives. Families and officers alike are burdened with not only coping with the situation, but trying to carry on when finances become strained. When the unthinkable occurs, we are here to help. We provide quick relief by helping with uncovered costs such as medical bills or living expenses. 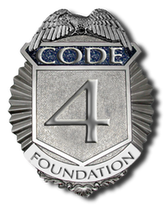 Code 4 creates a way for fellow officers and agents to help each other out while receiving the benefit of a tax free donation. As a non-profit run by agents and officers alike, we are committed to keeping administrative costs to a bare minimum and ensuring that funds are distributed quickly to those in need. Do you or does someone you know need us to back them up?